Abstract - The data center industry is changing and growing at a striking pace. Large build-outs are causing supply-chain strains and skill shortages, while innovations in networking, power, and resiliency are creating new opportunities, but creating challenges as well. 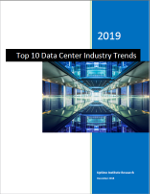 In this report, the Uptime Institute Research team takes a deep look into what changes data center owners, managers, and operators should expect in 2019.